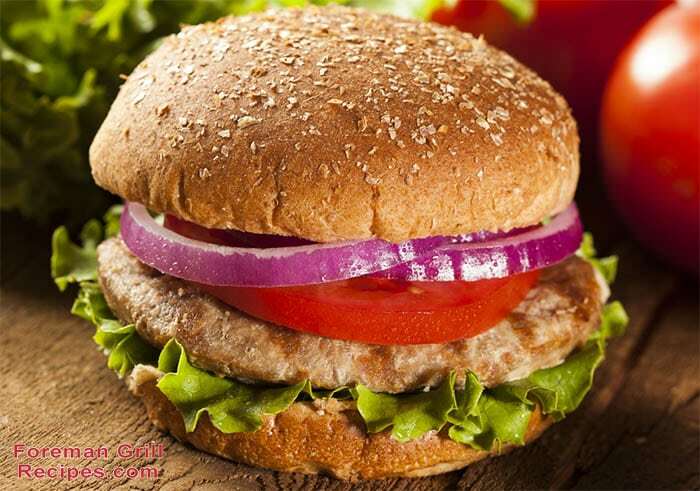 Turkey burgers are wonderful alternatives to traditional ground beef burgers. They’re lean, healthy, and full of flavor. Plus, they can be served just like a regular hamburger with all of your favorite toppings. Making turkey burgers on your Foreman Grill is just as easy as making regular hamburgers. You’ll want to make sure the turkey burgers are cook all the way through so plan on grilling to “well done”. With a couple of added ingredients to the ground turkey, your Foreman Grill turkey burgers will be tender, juicy, and will be a new favorite for yourself and for the entire family. Preheat your Foreman Grill for at least 5 minutes with the lid closed. If you have a temperature gauge use the “high” setting. Combine turkey, parsley flakes, bread crumbs, Worcestershire sauce and salt in a bowl and mix well with your hands. Form mixture into 4 patties which will be about 1/4 inch thick. Place on grill and close cover. Turkey burgers will take approximately 5-8 cook minutes to cook through but be sure to check on them after about 4 minutes. You can also give them a 1/4 turn halfway through cooking time to get nice grill marks. Serve on fresh buns with your favorite condiments.